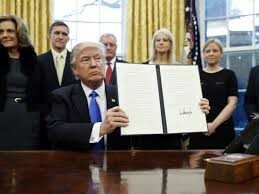 On Feb. 9, 2017, the U.S. Court of Appeals for the Ninth Circuit ruled in State of Washington v. Trump to uphold a lower court’s order to stay the Administration’s executive order (EO) barring entry into the United States of foreign nationals from designated countries. The decision by a three-judge panel (appointees of Presidents Jimmy Carter, George W. Bush and Barack Obama, respectively) was unanimous. The court did not decide whether President Trump’s travel ban, formally titled “Protecting the Nation From Foreign Terrorist Entry Into the United States,” violated the Constitution. Instead, the court ruled only that, in its analysis, there was enough evidence to support claims by the plaintiff-appellees to leave the lower court’s order in place and bar enforcement of the EO until those claims could be resolved. The court rejected the Assistant Attorney General’s argument that the Executive Branch, the President of the United States, determinations on immigration and the safety of the country, are beyond review of courts. “[A]lthough the Government points to the fact that Congress and the Executive identified the seven countries named in the Executive Order as countries of concern in 2015 and 2016,” the court stated in part, “[t]he Government has not offered any evidence or even an explanation of how the national security concerns that justified those designations, which triggered visa requirements, can be extrapolated to justify an urgent need for the Executive Order to be immediately reinstated.” The court also held that the states had legal standing to challenge the alleged “religious discrimination” under the Establishment Clause of the First Amendment. According to the Institute of International Education (IIE), there are roughly 1 million international students studying in the United States. USA Today, citing 2015 Department of Homeland Security data, reported that almost 24,000 students from Iran, Iraq, Libya, Somalia, Sudan, Syria and Yemen—the seven countries named, were affected by the EO travel ban. The vast majority of students impacted are from Iran. These students outnumber those from the other six countries combined, according to IIE figures. Academic conferences have also been affected by the ban, with citizens of the nations named in the order hesitant to travel to the United States for fear that their travel will be disrupted or that they will not gain entry when they arrive. Likewise, U.S.-based nationals or dual nationals from the seven named countries are shelving plans to travel to conferences abroad to avoid the possibility that they might not be able to re-enter the United States. There are indications that the Trump Administration is revising the EO to address the legal challenges raised by the court; all eyes are on the Trump Administration, waiting the next iteration of the immigration EO. ADEA will provide an update if a new EO is issued.